I thought it was great, because it was crazy, different, and just plain well written, but a lot of people (…on the internet. Do they really still count as people?) were upset about Peter Parker being DEAD FOREVERZ and being so disrespectfully replaced by one of his worst enemies, I would guess mainly because they were 12 years old and didn’t understand how death in superhero comics works (or fails to work) yet. 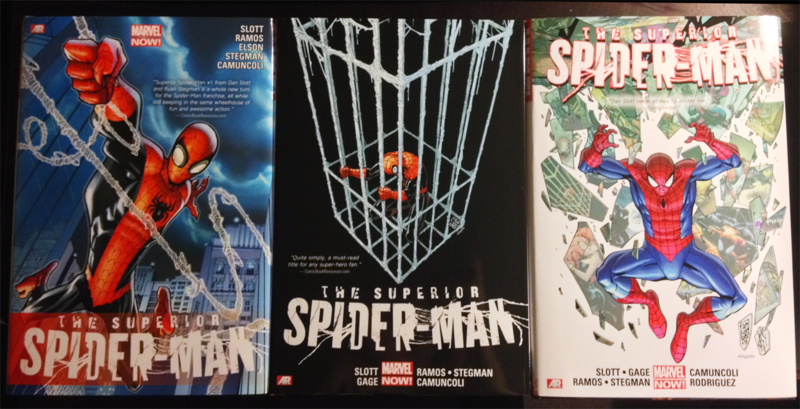 While the title and numbering of the book changed it was really just another arc in Dan Slott’s long Spider-Man run. Obviously the real Spider-Man comes back and the end and everything is fine and any reasonable person knew that would be the case from the very beginning, but that didn’t stop it from being a ridiculously entertaining read. I don’t know if I’d recommend this as any kind of good starting point for reading Spider-Man, even though it is kind of sort of a “new” version with a new start and a self-contained series of its own, again, it’s still just a piece of a very long run of Spider-Man overall and is pretty heavy on references and continuances of plot threads from the previous years of the regular title. It’s definitely a high point in the history of Spider-Man for me though. It really makes me want to go back and do a big Spider-Man mass read again, especially all the post Brand New Day era stuff that led up to this, but that will have to wait a little bit longer. This entry was posted in Comics and tagged Comics, dan slott, marvel, spider-man, superior spider-man.